Simplified methods to assess the effectiveness of wheel and rail dampers. Shifting more traffic to rail and increasing rail's market share can only be achieved with sustainable noise and vibration mitigation measures. Rolling noise is the dominant source of noise during normal operations; in recent years various damping solutions have been developed and ISVR has been a leading figure in their early stage research and development, in particular for rail dampers. Once these technologies are adopted in-situ an assessment of their effectiveness is required but this involves expensive field tests. A further drawback of this is that the results are not readily transferable from the measurement situation to another. To propose a solution a project was started within the Deufrako consortium. It was named STARDAMP (Standardisation of damping technologies for the reduction of railway noise) and was born with the objective of developing test methods that could be used in the laboratory to assess rail and wheel dampers. In order to interpret the results a prediction method was required and it was decided to have it in the form of an easy-to-use software. Thompson, D. J., & Toward, M. G. R. (2012). Laboratory methods for testing the performance of acoustic rail dampers. Paper presented at Acoustics 2012, France. Betgen, B., Bouvet, P., Squicciarini, G., & Thompson, D. J. (2013). 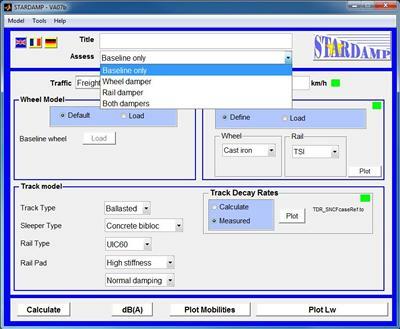 The STARDAMP software: an assessment tool for wheel and rail damper efficiency. Paper presented at AIA-DAGA 2013 Conference on Acoustics, Italy. Toward, M. G. R., Squicciarini, G., Thompson, D. J., & Gao, Y. (2013). 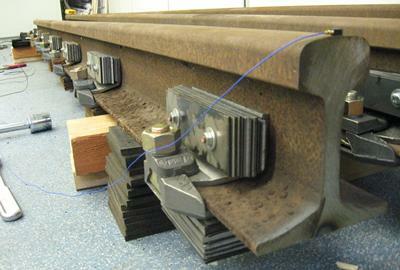 Estimating the performance of rail dampers using laboratory methods and software predictions. Paper presented at 11th International Workshop on Railway Noise (IWRN), Sweden. Betgen, B., Bouvet, P., Squicciarini, G., Thompson, D. J., & Jones, C. J. C. (2013). Estimating the performance of wheel dampers using laboratory methods and a prediction tool. Paper presented at 11th International Workshop on Railway Noise (IWRN), Sweden. Betgen, B., Bouvet, P., Thompson, D. J., Demilly, F., & Gerlach, T. (2012). Assessment of the efficiency of railway wheel dampers using laboratory methods within the STARDAMP project. Paper presented at Acoustics 2012, France. Venghaus, H., Thompson, D. J., Toward, M. G. R., Bumke, D., Kitson, P., Asmussen, B., & Starnberg, M. (2012). 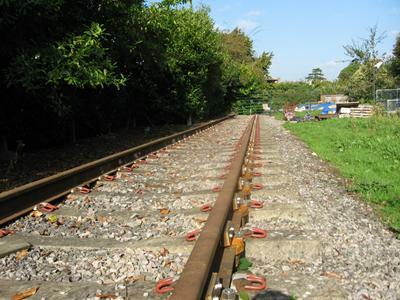 Assessment of the efficiency of rail dampers using laboratory methods within the STARDAMP project. Paper presented at 38th German Annual Conference on Acoustics (DAGA), Germany. Betgen, B., Pascal, B., Thompson, D. J., Demilly, F., & Gerlach, T. (2012). Assessment of the efficiency of railway wheel dampers using laboratory methods within the STARDAMP project. Paper presented at 38th German Annual Conference on Acoustics (DAGA), Germany.